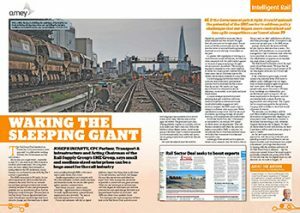 CPC’s Joseph Infante, features in Rail magazine’s latest publication, (Issue 872, 13 February 2019), where he discusses the impact of the new Rail Sector Deal on SMEs (Small or Medium Sized Enterprises). Joseph asserts that “The SME community in UK rail is, by just about any measure, the most effective and diverse in the world, but the rail network has not been getting the full benefit of that diversity, agility, openness and innovation, because of outmoded procurement practices and an operational culture that has looked too much to the past. The emphasis in the Rail Sector Deal on digital rail and new ways of working is a positive sign that this is about to change, and the stated aim to direct more spending through SMEs, is the surest way to make certain that it does. To read the full Rail magazine article, please click here.